When slots developers get bored of space, Greek mythology, and big movie tie-ins, they often turn to the underwater world for inspiration. 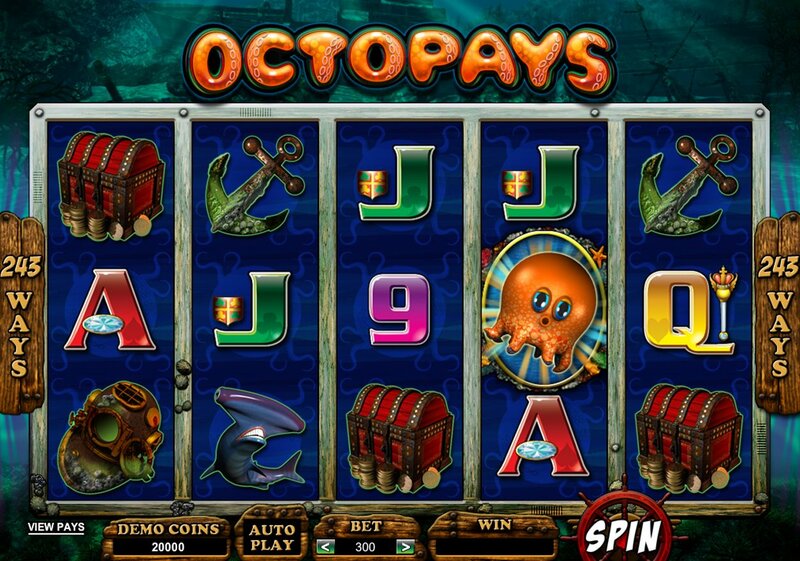 World famous slot developer Microgaming are no different in that respect, and their aquatic-themed slot, Octopays, if not exactly breaking the mould, should provide enough watery thrills to keep even the most jaded of slots fiends happy for a while. This marine themed slot game has 5 reels and 243 ways-to-win, along with a range of bonus features that include Wild, Bonus Wild, free spins and Multipliers. There’s some nice atmospheric music and a sunken treasure vibe in this game: on the reels are featured hammerhead sharks on the prowl, treasure chests, anchors and old diving helmets. There are also some fairly generic 9-through-Ace symbols filling out the reels. Five treasure chests pays out a 3,200-coin jackpot. The baby octopus symbol acts as the game’s Wild symbol, and it only appears on reels 2 and 4. It does substitute for all symbols in Octopays, however. This is a Wild with a difference, though, as it helps trigger the game’s bonus round when appearing on reels 2 and 4 at the same time. When they do, the Kraken feature will be triggered and 12 free spins awarded. At the start of each spin, up to four Wilds can be placed by the giant Kraken – here a rather massive red squid rather than a Greek mythical beast – on any reel other than reel 3. If a Moray Eel Scatter appears during the free spins (on reel 3 only), the Octopus will ink himself (nice), and any win he helps form is multiplied by two. A generous – if at first confusing – bonus round is the draw here, and it’s just about enough to warrant a closer underwater inspection. The 243-ways system is a little heavy on the bankroll, and the game should probably reward players a little better than it does considering the outlay. 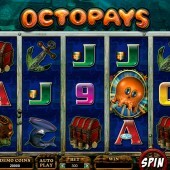 As it is, Octopays is a perfectly adequate addition to the list of sea-faring slots out there. The Finding Nemo-thon of Betsoft Gaming’s watery Under the Sea slot or the underwater thrills of Microgaming’s Mermaids Millions may prove to be better alternatives, but this is a fine simple sea slot to while away a few hours.